Lesson learned! Very special guest Beyoncé shut down the 2016 CMA Awards in Nashville on Wednesday, November 2. 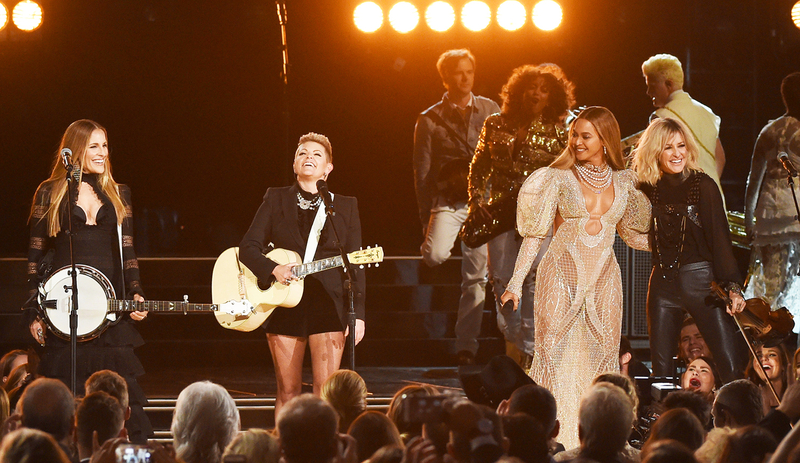 The pop/R&B megastar surprised country music’s biggest fans and stars with a performance of “Daddy Lessons” with the Dixie Chicks. Watch the incredible collaboration in the clip above! Queen Bey, 35, stunned in a sheer embellished gown with puff sleeves while the Dixie Chicks wore all black. During their high-energy performance — which included a bevy of banjos! — Matthew McConaughey was spotted dancing in the audience looking awestruck. The performance marked the Houston native’s first-ever Country Music Association Awards gig. Last year, Justin Timberlake genre-hopped and performed "Tennessee Whiskey" and "Drink You Away” with Chris Stapleton. The Dixie Chicks helped introduce Queen Bey to country music lovers, covering “Daddy Lessons” on their summer 2016 tour, but the Dream Girls actress first dipped her toe into Nashville waters when she released the twangy song off her Lemonade album in April. Watch the clip of her performance above and see the internet’s reaction to Bey’s performance below. Plus, click here to get your free download of “Daddy Lessons” by Beyonce featuring the Dixie Chicks! Beyoncé is from Houston and The Dixie Chicks are from Dallas. That performance was FOR TEXAS.